Aaron Chapman Builders strives to maintain good relationships with their clients through the often stressful process of construction by employing excellent methods communication, organization, and scheduling. The following are some highlights of clients’ opinion of working with ACB. Please scroll down to view testimonials in full. Personal referrals are available upon request. ¶We hired Aaron Chapman in the fall of 2007 to completely remodel our 2,050 sq. ft. home. We hired him because we had seen several examples of his work and were impressed by it and also because we knew he was honest and reliable. We were not disappointed. ¶ … He obtained plan approval by the city, demolished the interior of the house down to the studs, and completely finished the project in a timely manner. Aaron, his crew and all the subs were completely professional, communicative and helpful. He still keeps in touch and has made a few minor “tweaks” to the project. ¶Aaron’s work was excellent; he was innovative, creative and came up with a number of great ideas. He also worked very well with our interior designer, coordinating his crew and subs. He is an excellent communicator and highly organized. We expected glitches and delays with a project of this scope and there were none. ¶We have recommended him to our friends and clients. You will not find a contractor more professional, trustworthy or honest. We enjoyed observing his tremendous sense of pride in his work. ¶Aaron was a great designer and builder. He utilized creative engineering to accommodate our wishes, but called in a Structural Engineer to make sure we could do what we wanted with one part of our (addition). We really appreciated the fact that Aaron did not have too big of an ego and he was willing to defer to an expert when he did not feel comfortable. I think that was one of the biggest things we liked about Aaron, besides the quality of his work; he did NOT have a big ego and was so easy to work with day in and day out. abilities go far beyond his years when it comes to his qualifications and professionalism. ¶Our whole project was such a positive experience. … We would recommend Aaron Chapman Builders to anyone, without hesitation and we have! ¶You could not hire a better contractor than Aaron Chapman. … (His) excitement led to wonderful, innovative ideas. ¶Aaron and the crew cleaned up every night. With a one year old just starting to walk and get into everything, we were a little concerned about dust and splinters and nails, etc. But that was never a problem. Aaron and his crew always left in the evenings with the house "Toddler ready". That was very important and impressive. …Friends and family are amazed and I could not recommend Aaron more highly than I do. ¶We hired Aaron Chapman Builders in the spring of 2011 to renovate our kitchen, an extensive repair and restoration project. 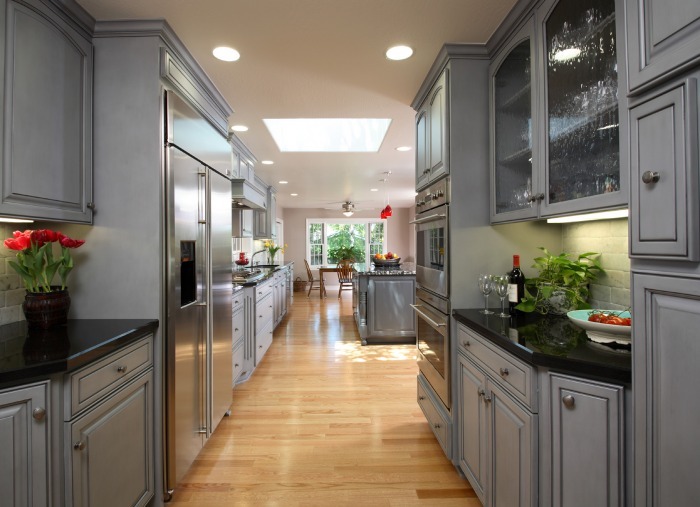 He obtained all of the necessary permits, did all the demolition work, replaced a large interior beam, and then rebuilt the kitchen with his assistance with our design plans. The result was an on time and on budget project and we were thrilled with the finished result. ¶He has a very good eye for design and provided very high quality craftsmanship in all aspects, including designing and building a custom wall wine rack. He is very organized, communicates well and promptly. ¶…He assured us that he would minimize mess and clean up daily. While we were dubious about how or if this could be accomplished, he succeeded and did the entire job with virtually no dirt, dust or sense of intrusion into our lives. ¶He was on time and on the job virtually every day. He and his crew were a pleasure to work with to have around. He provided excellent subs. There were no dangling final issues that failed to be resolved and no difficulty in completing all aspects of the project. ¶He is totally honest and reliable. We unreservedly recommend him to you.